MORRISTOWN, NJ – The Tri-State Railway Historical Society, Inc. announced Friday that it will be acquiring Rahway Valley Railroad (RV) GE 70-tonners Nos. 16 and 17. The United Railroad Historical Society of NJ (URHS), owner of the locomotives, voted to transfer title to Tri-State after the latter organization pledged funds and resources to make immediately-needed repairs, and to explore options to make one of the two units operational. Learn more about Rahway Valley 16 and Rahway Valley 17. In the summer of 2017, it was found that No. 16 has four severely damaged axles which prevent it from moving any sizable distance. In recognition of its historic significance to New Jersey, Tri-State adopted the project of repairing the locomotive to permit its movement to Boonton. The group’s equipment committee has developed a formal plan to repair the locomotive and, after culling resources and funds, Tri-State’s Board of Directors expressed interest in formally acquiring the locomotives. Richard King, Tri-State’s Treasurer, has tirelessly researched the RV and authored two books on the subject. “The Rahway Valley was a small railroad which meant much to many. The stories of its operations tell of characters larger than life, from the three generations of the Clark family which managed it to the countless men and women that worked there in its 95-years” said King. The locomotives will be stored in Boonton, NJ at the URHS rail yard. No. 17 is currently in Boonton, but No. 16 needs heavy repair before it can be moved. In early Spring, the locomotive will be lifted and will have its trucks disassembled. Three axles will have the journals turned at UTC/RAS in Morton, PA and the brasses for the corresponding axles will be re-poured to accommodate the new journal dimensions. This will enable the locomotive to move over NJ Transit’s Morristown and Montclair/Boonton Lines without issue. This work is funded by generous grants from private donors. Tri-State has allocated funds to have both locomotives professionally evaluated for a potential return to service. Nos. 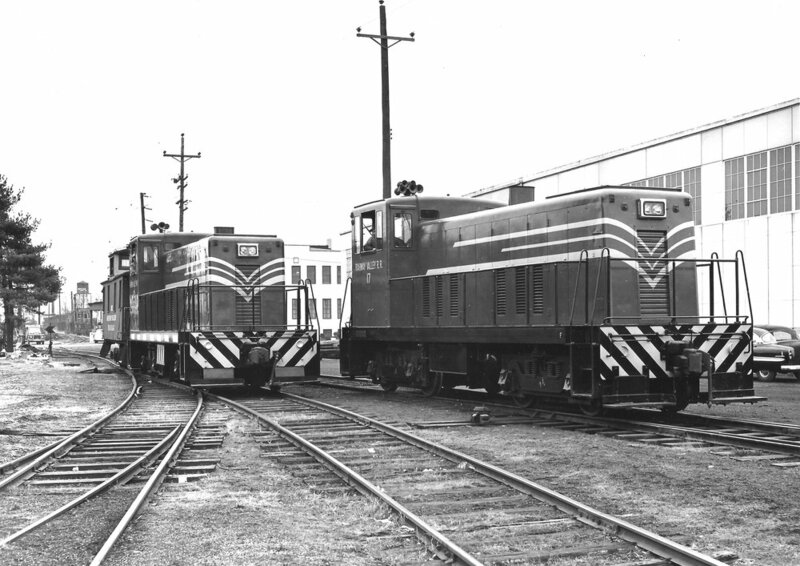 16 and 17 were constructed, respectively, in 1951 and 1954 by General Electric in Erie, PA for the Rahway Valley Railroad. The RV was an 11.8-mile long short-line railroad which operated between Roselle Park and Summit, NJ, with a branch line to Maplewood, in Union and Essex Counties. The railroad operated a succession of 15 steam locomotives during its lifetime until purchasing No. 16. One steam locomotive was kept operational until the arrival of No. 17 three years later. The RV’s last steam locomotive, No. 15, is on display at the Steamtown National Historic Site in Scranton, PA. The railroad hauled a variety of freight, including cement, lumber, coal, plastic, and steel, and operated passenger service until 1919. In 1986, the RV was acquired by the NYS&W and Nos. 16 and 17 were removed from the property in favor of EMD power. The railroad was abandoned in 1992. Nos. 16 and 17 were donated to URHS by the New York, Susquehanna, & Western Railway (NYS&W) in 1995. They were moved to the Morristown & Erie Railway (M&E) in Whippany, NJ in the early 2000s. Nos. 16 and 17 were cosmetically restored by the Whippany Railway Museum and displayed there for the past decade. Neither locomotive is operational. In 2016, the Morristown & Erie Railway entered into a car storage agreement and requested that all surplus equipment be removed from the property. The URHS arranged to have both locomotives, along with an old wrecking crane and idler car, moved to its yard in Boonton, NJ in April 2017. Unfortunately, No. 16 developed hot journals and could not complete the move. The Tri-State Railway Historical Society, Inc. was formed in 1964 as a non-profit educational organization dedicated to the preservation of New Jersey's rich railroad heritage. The group restores and operates historic rail equipment, publishes The Block Line magazine and other railroad books, and holds railroad events to involve the public in New Jersey railroad history. Learn more at http://www.tristaterail.org/.